Phosphorus (P) is one of the most important elements for plant growth and metabolism. It plays key roles in many plant processes such as energy metabolism, the synthesis of nucleic acids and membranes, photosynthesis, respiration, nitrogen fixation and enzyme regulation (Raghothama, 1999). Adequate phosphorus nutrition enhances many aspects of plant development including flowering, fruiting and root growth. Phosphorus (P) is a limiting factor to plant growth and productivity on 40% of the world's arable soil (Vance, 2001). P uptake in plants is often constrained by the very low solubility of P in the soil. P forms insoluble complexes with cations and is incorporated into organic matter due to microbial activity. In agricultural systems, phosphorus in the harvested crops is removed from the system, resulting in P deprived soils if no P is supplemented as fertilizer. P fertilizer in the form of rock phosophate (phosphate salts) are applied in large quantities each year to soils in the United states. These salts are chemically unstable, and over 60 % of the phosphorus may revert to poorly soluble mineral phosphate (Barrow, 1980). This re-precipitation of phosphate fertilizer means that farmers often apply up to four times the phosphate that is removed by the harvest. This practice leads to phosphate pollution of lakes, streams and groundwater. The consequence is an exuberant growth of algae and other aquatic plants in P-polluted water systems, a process known as eutrophication that kills fish and imbalances aquatic ecosystems (Brady and Well, 2002). Another great reason for concern is that by some estimates, the reserves of inexpensive rock phosphate could be depleted in as little as 60-80 years (CAST, 1988; Runge-Metzger, 1995). Moreover, rock phosphate is not available in the tropics and subtropics where most of earth's population lives and where the highly weathered soils are especially prone to P-deficiency. Phosphorus deficiency has been stated as one of the reasons why sub-Saharan Africa is the only major region in the world where per-capita food production has actually declined in the past three decades (Brady and Well, 2002). Plants have adapted two broad strategies that enhance P acquisition and use: (a) those directed toward improved acquisition or uptake and (b) those targeted to conserve use (Lajtha and Harrison, 1995). 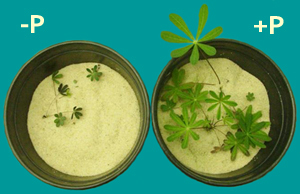 Strategies that lead to better uptake or acquisition include expanded root surface area through increased root growth and root hair development (Lynch and Brown, 1998; Gilroy and Jones, 2000), organic acid synthesis and exudation (Marschner et al., 1986; Gilbert et al., 1998), enhanced expression of phosphate transporters (Raghothama, 1999), and mycorrhizal associations (Marschner and Dell, 1994). Strategies aimed at conserving P involve internal remobilization of P, a decreased growth rate (Raghothama, 1999), more growth per unit P taken up (Lynch and Brown, 1998), and a modified carbon metabolism (Plaxton and Carswell, 1999). Barrow NJ (1980) Evaluation and utilization of residual phosphorus in soils. In Fea Khasawneh, ed, The role of Phosphorus in Soils. American Society of Agronomy, Madison, WI, pp 335-355. Brady NC, Well RR (2002) The nature and properties of soil, Ed 13. Prentice Hall, Upper Saddle River, NJ. CAST (1988) Long Term Viability of U.S. Agriculture. In. Council for Agricultural Science and Technology, Ames, IA. Gilbert GA, Vance CP, Allan DL (1998) Regulation of white lupin metabolism by phosphorus availability. In JP Lynch, J Deikman, eds, Phosphorus in Plant Biology: Regulatory Roles in Molecular, Cellular, Organismic and Ecosystem Processes. American Society of Plant Physiology, Rockville, MD. Gilroy S, Jones DL (2000) Through form to function: root hair development and nutrient uptake. Trends Plant Sci 5: 56-60. Lajtha K, Harrison AF (1995) Strategies of phosphorus acquisition and conservation by plant species and communities. In H Tiessen, ed, Phosphorus in the Global Environment. John Wiley and Sons, Chichester, UK, pp 140-147. Lynch JP, Brown KM (1998) Regulation of root architecture by phosphorus availability. American Society Plant Physiology, Rockville, MD. Marschner H, Dell B (1994) Nutrient uptake in mycorrhizal symbiosis. Plant Soil 159: 89-102. Marschner HV, Romheld V, Horst WJ, Martin P (1986) Root-induced changes in the rhizoshpere: Importance for the mineral nutrition of plants. Zeitschrift fur Pflanzenernaehrung und Bodenkunde 149: 441-456. Plaxton WC, Carswell MC (1999) Metabolic aspects of the phosphate starvation response in plants. In HR Lerner, ed, Plant Responses to Environmental Stress: From Phytohormones to Genome Reorganization. Marcel-Dekker, New York, NY, pp 350-372. Raghothama KG (1999) Phosphate acquisition. Ann Rev Plant Physiol Plant Mol Bio 50: 665-693. Runge-Metzger A (1995) Closing the cycle: obstacles to efficient P management for improved global security. In H Tiessen, ed, Phosphorus in the Global Environment. John Wiley and Sons Ltd, Chichester, UK, pp 27-42. Vance CP (2001) Symbiotic nitrogen fixation and phosphorus acquisition. Plant nutrition in a world of declining renewable resources. Plant Physiol 127: 390-397.